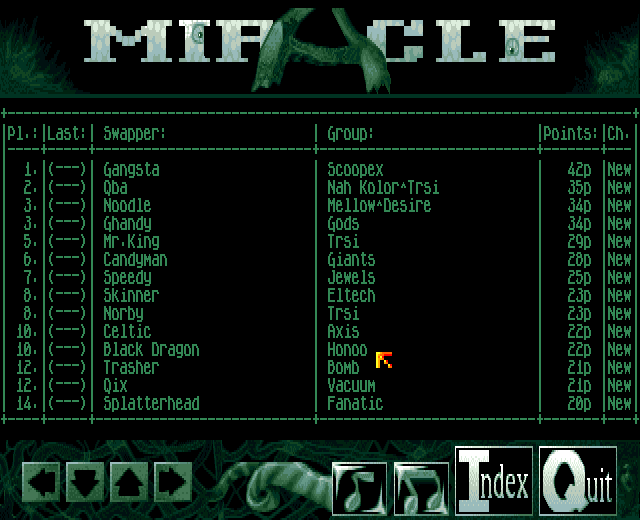 Miracle was created by IRIS, a group with a long history on the Amiga. The crew came to life in the 1980’s and continued their activities up until the year 2009. They have been quiet since, but one never knows if they suddenly pops into the spotlight again with a new demo or not. 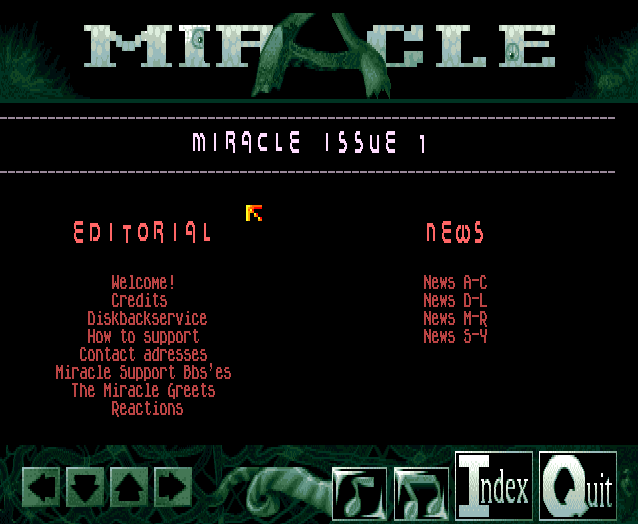 This diskmag, Miracle, was released in the year of 1996. The main editor of the magazine was MJ of IRIS, who had been active as a swapper for many years. It is therefore not strange that Miracle was aimed at this particular group of people, namely swappers. If we look at the content, it is clear that a lot of the stuff is of particular interest to that group. Still, it is an interesting read for everyone, as there is a wide variety of articles available for reading. When looking at this magazine today, I’m amazed by the vast amount of swapper adverts and regular news that was included in the magazine. Hundreds and hundreds of people are present and this really shows how active the Scene was back in the middle of the 90’s. The section covering recent news about groups on the Scene is gigantic and it can be interesting to browse through to get a glimpse of what was going on back then. For those interested in the history of this sub-culture, you’ll find a ton of helpful information there. I enjoy browsing these sections for that, but also for nostalgic reasons. The magazine does also contains charts/rankings of the best swappers at that time. People could send in votes and place their vote on their favorites. As for the design of the magazine, I think it is quite nice. The panel/interface is both functional and good-looking. That makes it easy for the user to browse through the different sections and articles. The music playing in the background is atmospheric and cosy and fits the “image” of the magazine well. Not much can be said about the coding from a users standpoint, other than that the engine seems to be working as it should, and that is of course the most important thing. Note: This review is based on an old one I did for Classicamiga.com many years ago. It was back in 2006 I believe. It’s great to see a new post on your blog! Don’t you think the first wave of Internet websites was influenced by diskmags? I mean design and layout-wise 🙂 These days I don’t find it pleasant and my eyes hurt a bit, but yes, it does pull the nostalgic string in my memory. I love those diskmag fonts! 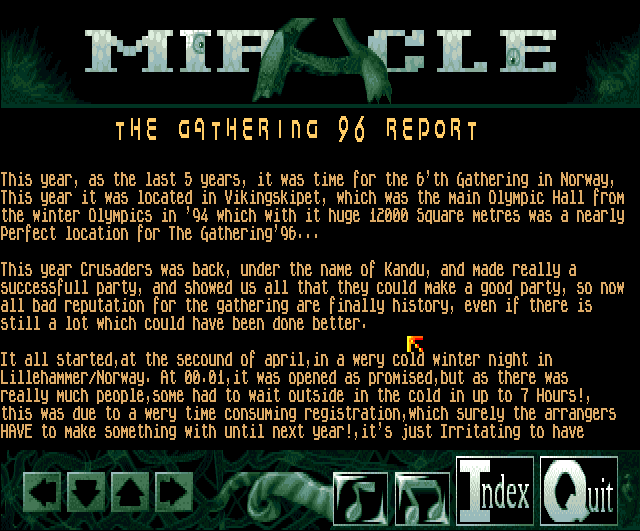 The readability is great, and it looks stylish as only the Amiga could be. I miss the time when the most important news in my life came from floppy disks. Hi Mads! Long time, no see! Glad you enjoyed the post. I completely agree with you concerning the design. I also miss the news from diskmags, charts and packs. 😉 Things were much more exotic back then. People one read about was real legends and nearly impossible to get in touch with if you didn’t know the right people. Now everyone’s Online and the mystery is not there the same way as it was. 🙂 Hope you are doing well and that you’ve got a nice autumn up there in the North!